His dad is now the assistant to Jimmy at Troon. Syme was on holiday. McCreadie was at Girvan last night. Not sure if he was injured. Number 10 was Evan Maley I believe. Played with Troon for a couple of seasons. What's with all the muck raking? The argument about the league cup giving smaller teams a pay day against there bigger neighbours could be removed by making these teams play a preseason friendly in alternate years. Some of the league cup games feel like friendlies with all the triallists etc. I was in the Beith end next to the dug out and it was packed. The wee shed with the young team looked really busy. Was a good crowd and great atmosphere from both ends. The ball was running toward the corner flag. Yellow all day for me. 1st half was even. 2nd Pollok were the better team. The ref didn't have a great game. Lots of soft free kicks and yellow cards. Hard to say if it had a bearing on the end result. Polloks third goal was a cracker. Great turn out for Pollok today. Busiest iv seen Portland Park in a while. Can't wait for this game. Both teams are on a good run. I imagine Pollok will be much improved from the opening day fixture. 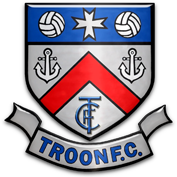 Hoping for goals aslong as Troon get 1 more.